What are the critical success factors in your model? 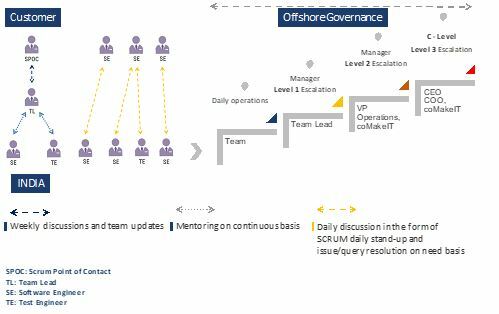 Adopting best practices such as shuttle diplomacy, people from customer’s native organization and distributed team working as a mixed scrum team, with a unified process and common backlog. What are the risks in your model? How do you ensure employee retention? In your view, what are the major flaws and risks with conventional IT service and offshoring model? How does your model overcome these flaws? Is your model flexible and scalable? Very much. You can downsize or scale up depending upon your business needs, subject to standard terms and conditions governing the contract. Significant part of the people and infrastructure risks are borne by us. What is the typical time taken to recruit, setup and operationalize a team? 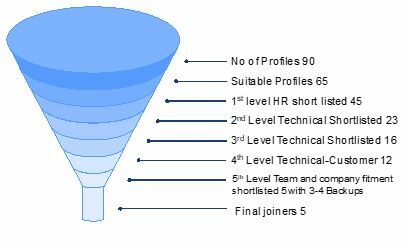 As the bulk of our recruitment is focused towards experienced people, who will be working in other companies, it typically takes 8-10 weeks for them to serve out their notice periods and join us, from the date of offer acceptance. On average, it is safe to assume that it will take approx. 2-3 months to setup a standard scrum team of 6-8 people. Obviously if we are looking for highly specialized skills, or seniority, or specific domain skills it could take a little longer to find the right people. How do you ensure IP protection? What are the touch points in your selection process? 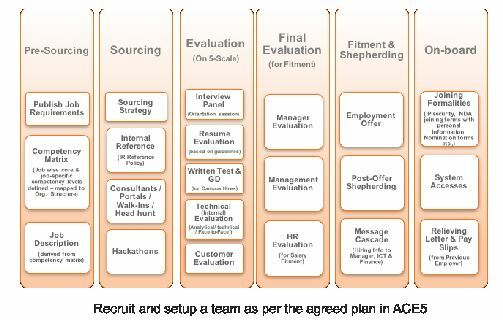 In the Align phase of our customer on-boarding methodology ACE5, we reach an agreement with the customer on the composition, skills, and structure of the team. Every team that we setup is tailored for the specific needs of the customer, and helps them realize their business and technology goals. Using our well-defined process called ARG (Attract-Retain-Grow), which encompasses the entire spectrum of Human Capital Development (HCD) activities ranging from sourcing, evaluation, hiring, on-boarding, to continuous assessment and performance management. A final offer is made to the selected individual only after receiving a written approval (Hiring Confirmation Document) from the customer. What is your Governance model? What recourse do we have if we are unhappy with the performance of a resource? Together with the customer’s designated representative, the engagement Manager assigned for this account will hold a periodic review of the team performance (typically done once a month). There is a clearly established process for giving feedback to the employees in a structured manner. Subject to standard contractual terms and conditions, the customer will always have the prerogative to ask for a replacement, if they are unsatisfied with the performance of any individual team member. In such a case, every effort will be made to recruit a new person to fill that vacancy.